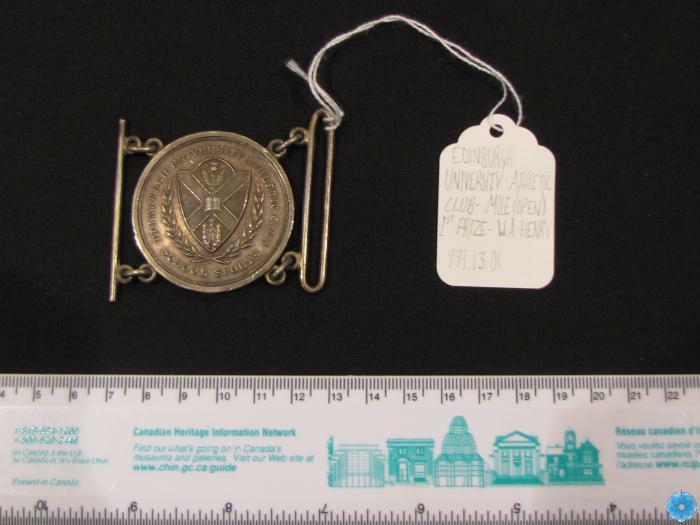 Marks/Label: Front: "EDINBURGH UNIVERSITY ATHLETIC CLUB / SCHOOL SPORTS" Back: "MILE (OPEN) / 1ST PRIZE / Won by / W.A.Henry Junr / Merchiston Castle / TIME 5 MINUTES 3 2/5 SECONDS"
Description: One medal of William A. Henry, Edinburgh U. Athletic Club. Open mile race, 1st place.